Friends and fans of ETA Matt Cage: Ron, Doreen, Bobbi, Judy, and Betty pose with Matt between sets at Elements/Flamboro on June 22nd, 2018. Photo Credit: Carolyn MacArthur. ETA Matt Cage, the ultimate performer, put on a great show on Friday night at Elements/Flamboro. Matt effortlessly covered the three decades of Elvis’s career, convincingly portraying a young Elvis, rocking the movie decade, and rolling with the concert years. With the help of Brent Freeman at the controls, Matt smoothly transitioned from song to song, adding some less frequently heard songs during his performance, much to the delight of the audience. ETA Matt Cage serenades a lucky lady and gives her a scarf during his Element/Flamboro performance. . Photo Credit: Carolyn MacArthur. With his winning personality, Matt gains new fans with each appearance. Several times on Friday he left the stage to mingle with the audience, acknowledging first time visitors and familiar faces alike with a wave of a hand, a smile, a serenade, a scarf, a comment or chat that warmed many hearts. Matt wore a 50s grey plaid sport jacket for his first set, a red speedway jacket for the movie era set, and a black jacket for the 70s decade and a smashing gold metal belt. I snapped my favourite photo of Matt (seen left) as he was preparing for his last set wearing the belt. The evening went by much too quickly, and all of Matt’s fans look forward to seeing him again very soon. 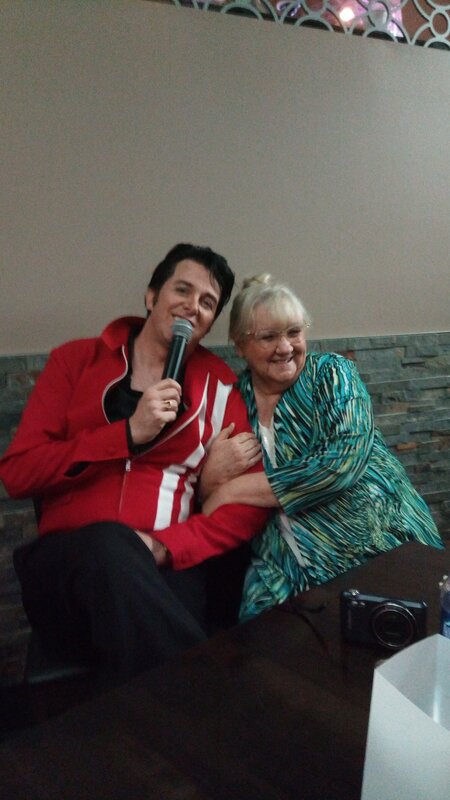 Matt, along with Derek Morris as Johnny Cash, will be performing at Zwick’s Park in Belleville on Canada Day at 4:30 pm. The concert is free with a $5.00 donation for parking. On Wednesday, July 18th, Matt will be at Casino Niagara at 3 and 6 pm for a free show. 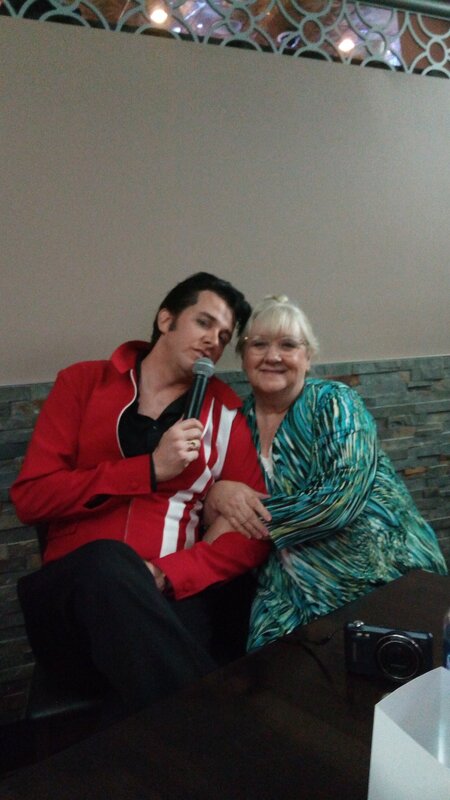 And at the end of July, Matt will be a guest performer at the Collingwood Elvis Festival Semi-Final and Champion Showcase. See you there for my first time at the Festival. Until then, cheers! Carolyn.